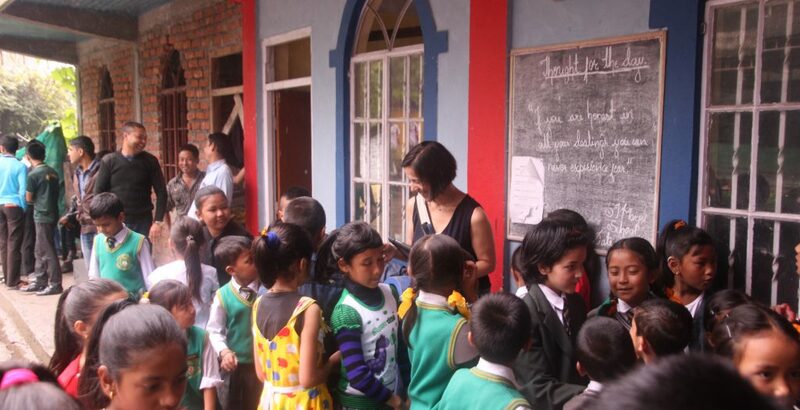 Improving Education In Kalimpong – Part 1: A Big Welcome! Ruth, one of our trustees, visited our projects in Kalimpong with the aim of working with the local teachers to help improve standards of education and engagement. Here, Ruth describes the start of her visit to the region. Arriving at Bagdogra in the humid, blasting heat, it is so lovely to be met by Sudhir and his driver. They look after us from the start and make sure we are comfy. Bagdogra is noisy and crowded and we make slow progress, but then we are free of the city and following the river along a windy, bumpy road – hooting constantly and windows up and down to protect us from blasts of dust! We are dropped off at Helambu Haven – a cosy homestay, with bungalows nestled in the mountainside, plants everywhere, chickens, dogs, cats. 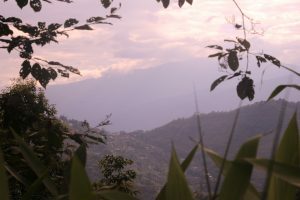 It is the perfect stay while we are in Kalimpong and when I return there again the following week on my own, it feels like coming “home”. We meet Santa the next day, who is to look after us for the rest of the week. A quick stop at the Mondo Offices in the centre of town gives us an idea of the set up and the map of where we will travel during the week. Santa has planned a number of visits for us to the schools in both Kalimpong and Darjeeling so that we can get a good feel of the different establishments, their communities and the people involved. We head out to Pioneer and Lotus schools, both run efficiently by friendly, welcoming headmasters. At Pioneer, the children are busy practising for Independence Day celebrations – marching in unison, music, standard bearing. Rain and puddles don’t stop the disciplined lines, broken by smiles, waves and giggles as we approach. It’s a family school, begun by the current headteacher’s father and the family live on site. Teaching is in the family and clearly a passion. Lotus is leaking, children are squashed on desks, dodging the raindrops. But that doesn’t stop the learning, nor the pride as the headteacher shows us around. The Head is a businessman by profession, but cares for his children and community. I check in with Mondo and yes, plans are afoot to help.